Carpal ligament instability is defined as any malalignment of the carpus. This may be evident on plain radiography as a static deformity; alternatively, the situation may be a dynamic one, which becomes evident only when external forces are placed on the wrist. The malalignment may appear after a single traumatic event or may be secondary to chronic attenuation of supporting ligaments after a traumatic event or secondary to an underlying disease process (eg, rheumatoid arthritis,pseudogout). The human wrist joint is a complex arrangement of small bones and ligaments that form a mobile yet stable link from the powerful forearm to the hand. The normally functioning carpus can position the hand precisely relative to the forearm and provides remarkably stable transmission of forces. Motion and stability of the carpus provide the critical foundation for maximum hand function from precise fine motor control to power grip activities. When the normal mechanics of the wrist are disrupted, the instability of the carpal bones results in weakness, stiffness, chronic pain, and often arthritis if not treated appropriately. Although the early clinical and radiographic findings may be subtle, an understanding of wrist kinematics and instability patterns can facilitate early diagnosis and management. Unfortunately, selecting the optimal treatment remains a difficult judgment in most cases. Linscheid et al described traumatic carpal instability in 1972. Since the early reports, anatomic and biomechanical studies have provided a foundation for understanding carpal motion, stresses, and pathologic instability. [2, 3] Building on these studies, various models have been suggested to explain the remarkable strength and mobility of this complex joint and the predictable patterns of failure. This article presents the current understanding of pathologic carpal instability, the common classification patterns, and early treatment options that may avoid protracted dysfunction. Appropriate hand therapy is essential to maximize recovery but requires an appreciation of the limitations of carpal instability dysfunction and the goals of various treatment options. The wrist contains eight carpal bones. Anatomically and functionally, these bones are divided into proximal and distal rows. The proximal row is formed by the scaphoid, the lunate, and the triquetrum. Although the pisiform is anatomically located on the palmar surface of the proximal row, it is a sesamoid bone within the flexor carpi ulnaris tendon; it does not contribute to the kinematics of the proximal row. The trapezium, the trapezoid, the capitate, and the hamate form the distal row. Multiple ligaments help stabilize the wrist to the forearm and hand. Extrinsic ligaments span the radiocarpal joint, whereas intrinsic ligaments form connections between individual carpal bones. An important extrinsic ligament on the dorsal aspect of the wrist is the dorsal radiocarpal ligament (see the first image below). This ligament originates on the radius and has minor attachments to the lunate, with the bulk of the attachment on the triquetrum. There are many more extrinsic ligaments on the volar aspect of the wrist. From radial to ulnar, they include the radioscaphocapitate, radioscapholunate, short radiolunate, long radiolunate, ulnolunate, and ulnotriquetrum ligaments (see the second image below). (Click image to enlarge.) Dorsal carpal ligaments. Copyright Mayo Clinic, used with permission of Mayo Foundation. (Click image to enlarge.) Volar carpal ligaments. Copyright Mayo Clinic, used with permission of the Mayo Foundation. The intrinsic ligaments are stout structures that originate and insert within the carpus. The two most important intrinsic ligaments include the scapholunate interosseous ligament (SLIL) and the lunotriquetral interosseous ligament (LTIL). The SLIL, which joins the scaphoid and the lunate, is probably one of the most important ligaments in the wrist. Injury of the SLIL can result in one of most common causes of carpal instability: scapholunate dissociation. The LTIL connects the lunate and triquetrum. Like the SLIL, the LTIL is C-shaped and has three separate components. Unlike the SLIL, it has a palmar component that is stouter than its volar component. Two intrinsic ligaments that cross from the proximal row to the distal row are the scaphocapitate ligament and the dorsal intercarpal ligament. The scaphocapitate ligament crosses the volar midcarpal joint and attaches from the distal pole of the scaphoid to the body of the capitate. Across the dorsal midcarpal joint, the dorsal intercarpal ligament originates from the triquetrum, attaches to the scaphoid dorsal ridge, and then inserts into the dorsal distal third of the scaphoid and to the scaphoid-trapezium ligament. Although this theory does not explain the coupled motions that occur within the proximal and distal rows, it does help explain the load patterns seen through the wrist. The scaphoid acts like a bridge between the proximal and distal row and protects the link from collapsing. Gilford et al also emphasized the instability of such a two-link system under load and the tendency for the system to crumple without a stabilizing mechanism. 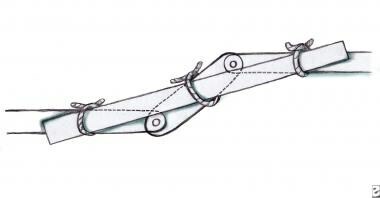 They believed that the scaphoid should be considered part of both rows and underscored its importance as a bridge, or tie rod, to stabilize an otherwise unstable arrangement (see the image below). The wrist is a simple link between the proximal and distal rows. The pivot point is at the center of rotation of the capitate and lunate. This joint, without other supporting structures, is stable only in tension. It is unstable in compression, as this figure depicts, and tends to collapse. Muscle contractions impart rotational moments to the proximal row through the distal row, and carpal motion is governed by a combination of ligamentous and articular constraints. The strong interosseous ligaments between the three proximal carpal bones enable them to move in a synchronized fashion during wrist motion. The scaphoid, lunate, and triquetrum rotate in the same primary direction, albeit to different magnitudes, during any motion of the hand. A specific example of this interaction may be observed during radial-ulnar deviation. As the wrist deviates ulnarly, the entire proximal row extends. Conversely, as the wrist deviates radially, the entire proximal row flexes. Although the mechanism by which this occurs has not been fully elucidated, most authors believe that this motion is a result of a combination of ligamentous constraints and carpal articular geometry between the proximal intercalated row and the distal row. A theory proposed by Linscheid and Dobyns in 1989 is that the distal pole of the scaphoid flexes because of pressure by the trapezium and trapezoid during radial deviation. The rest of the proximal row then flexes because of the strong interosseous ligaments connecting the lunate to the scaphoid and the triquetrum to the lunate. 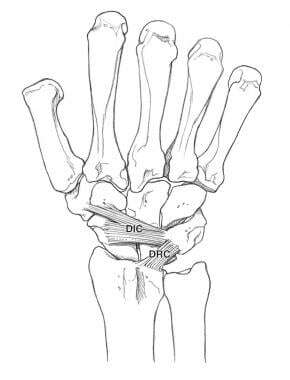 In another theory, Weber proposed that the unique helicoidal shape of the triquetrohamate articulation forces the distal row to translate dorsally and the triquetrum to tilt into extension as the wrist deviates ulnarly. Dorsal translation of the distal row contributes to an extension moment on the proximal row. The opposite occurs during radial deviation with palmarly directed force on the proximal row, causing flexion. Some have theorized that an individual's carpal kinematic behavior can be explained by some combination of the columnar theory with the row theory. Craigen and Stanley analyzed radiographs of 52 normal wrists and found that from ulnar deviation to radial deviation, the amount of scaphoid shortening and ulnar translation of the scaphoid varies in a normal distribution. If the scaphoid shortens more, it translates less. By their interpretation, a column-type wrist shows greater shortening. They also found that females were more likely to have greater scaphoid shortening and less translation. This individual variation in kinematic behavior was also supported by Garcia-Elias et al, who attributed it to individual variation in laxity. They examined 60 healthy volunteers and found that physiologic differences in wrist ligamentous laxity affected carpal kinematics. In radial-ulnar deviation, the scaphoid of very lax wrists moved preferentially in the sagittal plane (flexion-extension), whereas in the more rigid wrists, the scaphoid moved preferentially in the frontal plane (radioulnar deviation). The oval-ring theory functionally depicts the carpus as a transverse ring formed by proximal and distal rows and joined by two physiologic links, one radial and the other ulnar. The radial link is the mobile scaphotrapezial joint, and the ulnar link is the rotatory triquetrohamate joint. This type of trauma can also result in injury to one or more ligamentous structures in the wrist, causing carpal instability. Perilunate instability is described as progressing from the scapholunate and the capitolunate to the lunotriquetral joint. Mayfield perilunate instability pattern. Copyright Mayo Clinic, used with permission of the Mayo Foundation. However, if the carpus is pronated and the hypothenar area is struck first, an ulnar traumatic pattern may be observed. Specifically, disruption of the ulnotriquetral ligament complex and the LTIL occurs. As the triquetrum no longer holds the lunate, it falls into a flexed position because of pressure from the capitate and its connection with the scaphoid. With attenuation or injury to the dorsal intercarpal ligament, a volar intercalated-segment instability (VISI) pattern ensues; this can be visualized on lateral radiography. An LTIL tear most commonly results in a VISI deformity. Some instability patterns arise after chronic attrition of supporting ligaments. One traumatic event may result in some subtle ligamentous injury but no clear instability initially. However, over time, continued normal daily loading of the wrist can result in symptomatic instability. An example is seen with scaphoid fractures, where a dorsal intercalated-segment instability DISI deformity tends to appear late after the initial traumatic event. Supporting ligaments can also be important in preventing carpal instability in the presence of other significant ligamentous injury. For example, many cadaveric studies have shown that isolated sectioning of the SLIL does not result in a frank radiographic scapholunate gap or dissociation. In 1986, Johnson and Carrera described a midcarpal instability in which the capitate dorsally subluxates out of the cup of the lunate during a fluoroscopic dorsal-displacement stress test. This is associated with a painful snap or click that reproduces the patient's symptoms. They attributed the cause of this instability to attenuation of the radioscaphocapitate ligament after prior trauma. Geissler and Freedland prospectively reviewed 60 displaced intra-articular distal radius fractures that were being treated with arthroscopy-assisted reduction and internal fixation. They found that 43% had concomitant tears in the fibrocartilage complex and 32% also had tears in the scapholunate ligament. Linscheid RL, Dobyns JH, Beabout JW, Bryan RS. Traumatic instability of the wrist. Diagnosis, classification, and pathomechanics. J Bone Joint Surg Am. 1972 Dec. 54(8):1612-32. [Medline]. Pulos N, Bozentka DJ. Carpal Ligament Anatomy and Biomechanics. Hand Clin. 2015 Aug. 31 (3):381-7. [Medline]. Lee DJ, Elfar JC. 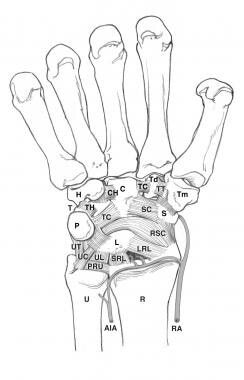 Carpal Ligament Injuries, Pathomechanics, and Classification. Hand Clin. 2015 Aug. 31 (3):389-98. [Medline]. Berger RA, Blair WF, Crowninshield RD, Flatt AE. The scapholunate ligament. J Hand Surg Am. 1982 Jan. 7 (1):87-91. [Medline]. Navarro A. Anales de Instituto de Clinica Quirurgica y Cirugia Experimental. Montevideo: Imprenta Artistica de Dornaleche Hnos. 1935. Gilford WW, Bolton RH, Lambrinudi C. The mechanism of the wrist joint with special reference to fractures of the scaphoid. Guy's Hospital Report. 1943. 92:52-59. Linscheid RL, Dobyns JH. Carpal instability. Curr Orthop. 1989. 3:106-114. Weber ER. Concepts governing the rotational shift of the intercalated segment of the carpus. Orthop Clin North Am. 1984 Apr. 15(2):193-207. [Medline]. Craigen MA, Stanley JK. Wrist kinematics. Row, column or both?. J Hand Surg Br. 1995 Apr. 20 (2):165-70. [Medline]. Garcia-Elias M, Ribe M, Rodriguez J, Cots M, Casas J. Influence of joint laxity on scaphoid kinematics. J Hand Surg Br. 1995 Jun. 20 (3):379-82. [Medline]. Lichtman DM, Bruckner JD, Culp RW, Alexander CE. Palmar midcarpal instability: results of surgical reconstruction. J Hand Surg Am. 1993 Mar. 18 (2):307-15. [Medline]. Mayfield JK. Mechanism of carpal injuries. Clin Orthop Relat Res. 1980 Jun. 45-54. [Medline]. Stanley JK, Trail IA. Carpal instability. J Bone Joint Surg Br. 1994 Sep. 76(5):691-700. [Medline]. Ruby LK. Carpal instability. Instr Course Lect. 1996. 45:3-13. [Medline]. Johnson RP, Carrera GF. Chronic capitolunate instability. J Bone Joint Surg Am. 1986 Oct. 68(8):1164-76. [Medline]. Dobyns JH, Linschied RL, Chao EYS. Traumatic instability of the wrist. American Academy of Orthopaedic Surgeons Instructional Course Lectures. 1975. 182-199. Jones WA. Beware the sprained wrist. The incidence and diagnosis of scapholunate instability. J Bone Joint Surg Br. 1988 Mar. 70(2):293-7. [Medline]. Tang JB. Carpal instability associated with fracture of the distal radius. Incidence, influencing factors and pathomechanics. Chin Med J (Engl). 1992 Sep. 105(9):758-65. [Medline]. Geissler WB, Freeland AE. Arthroscopically assisted reduction of intraarticular distal radial fractures. Clin Orthop Relat Res. 1996 Jun. 125-34. [Medline]. Weber ER. Biomechanical implications of scaphoid waist fractures. Clin Orthop Relat Res. 1980 Jun. 83-9. [Medline]. Watson HK, Weinzweig J, Zeppieri J. The natural progression of scaphoid instability. Hand Clin. 1997 Feb. 13(1):39-49. [Medline]. Kuo CE, Wolfe SW. Scapholunate instability: current concepts in diagnosis and management. J Hand Surg Am. 2008 Jul-Aug. 33 (6):998-1013. [Medline]. Easterling KJ, Wolfe SW. Scaphoid shift in the uninjured wrist. J Hand Surg Am. 1994 Jul. 19 (4):604-6. [Medline]. Kleinman WB, Carroll C 4th. Scapho-trapezio-trapezoid arthrodesis for treatment of chronic static and dynamic scapho-lunate instability: a 10-year perspective on pitfalls and complications. J Hand Surg Am. 1990 May. 15 (3):408-14. [Medline]. Reagan DS, Linscheid RL, Dobyns JH. Lunotriquetral sprains. J Hand Surg Am. 1984 Jul. 9 (4):502-14. [Medline]. Linscheid RL. Scapholunate ligamentous instabilities (dissociations, subdislocations, dislocations). Ann Chir Main. 1984. 3(4):323-30. [Medline]. Lichtman DM, Schneider JR, Swafford AR, Mack GR. Ulnar midcarpal instability-clinical and laboratory analysis. J Hand Surg Am. 1981 Sep. 6 (5):515-23. [Medline]. Pliefke J, Stengel D, Rademacher G, Mutze S, Ekkernkamp A, Eisenschenk A. Diagnostic accuracy of plain radiographs and cineradiography in diagnosing traumatic scapholunate dissociation. Skeletal Radiol. 2008 Feb. 37(2):139-45. [Medline]. Kindynis P, Resnick D, Kang HS, Haller J, Sartoris DJ. Demonstration of the scapholunate space with radiography. Radiology. 1990 Apr. 175 (1):278-80. [Medline]. Bednar JM, Osterman AL. Carpal Instability: Evaluation and Treatment. J Am Acad Orthop Surg. 1993 Oct. 1 (1):10-17. [Medline]. McMurtry RY, Youm Y, Flatt AE, Gillespie TE. Kinematics of the wrist. II. Clinical applications. J Bone Joint Surg Am. 1978 Oct. 60(7):955-61. [Medline]. Cognet JM, Baur P, Gouzou S, Simon P. [Bulge of the scapholunate ligament: an arthro-CT sign of traumatic scapholunate instability]. Rev Chir Orthop Reparatrice Appar Mot. 2008 Apr. 94(2):182-7. [Medline]. Sulkers GSI, Strackee SD, Schep NWL, Maas M. Wrist cineradiography: a protocol for diagnosing carpal instability. J Hand Surg Eur Vol. 2018 Feb. 43 (2):174-178. [Medline]. [Full Text]. Herbert TJ, Faithfull RG, McCann DJ, Ireland J. Bilateral arthrography of the wrist. J Hand Surg Br. 1990 May. 15 (2):233-5. [Medline]. Viegas SF, Ballantyne G. Attritional lesions of the wrist joint. J Hand Surg Am. 1987 Nov. 12 (6):1025-9. [Medline]. Cooney WP. 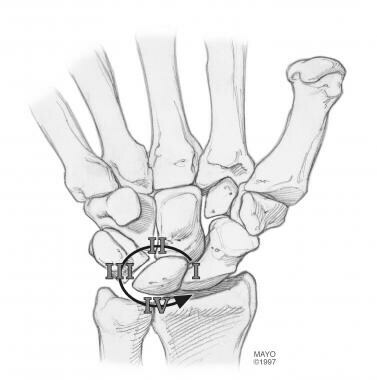 Evaluation of chronic wrist pain by arthrography, arthroscopy, and arthrotomy. J Hand Surg Am. 1993 Sep. 18 (5):815-22. [Medline]. Kelly EP, Stanley JK. Arthroscopy of the wrist. J Hand Surg Br. 1990 May. 15 (2):236-42. [Medline]. Roth JH, Haddad RG. Radiocarpal arthroscopy and arthrography in the diagnosis of ulnar wrist pain. Arthroscopy. 1986. 2(4):234-43. [Medline]. Bain GI, Munt J, Turner PC. New advances in wrist arthroscopy. Arthroscopy. 2008 Mar. 24(3):355-67. [Medline]. Leng S, Zhao K, Qu M, An KN, Berger R, McCollough CH. Dynamic CT technique for assessment of wrist joint instabilities. Med Phys. 2011 May. 38 Suppl 1:S50. [Medline]. [Full Text]. Abou Arab W, Rauch A, Chawki MB, Dap F, Dautel G, Blum A, et al. Scapholunate instability: improved detection with semi-automated kinematic CT analysis during stress maneuvers. Eur Radiol. 2018 Oct. 28 (10):4397-4406. [Medline]. Taleisnik J. Post-traumatic carpal instability. Clin Orthop Relat Res. 1980 Jun. 73-82. [Medline]. Kani KK, Mulcahy H, Porrino J, Daluiski A, Chew FS. Update on operative treatment of scapholunate (SL) instability for radiologists: part 1-SL ligament repair, dorsal capsulodesis and SL ligament reconstruction. Skeletal Radiol. 2017 Dec. 46 (12):1615-1623. [Medline]. Kani KK, Mulcahy H, Porrino J, Aaron D, Chew FS. Update on the operative treatment of scapholunate instability for radiologists. II. Salvage procedures, total wrist arthrodesis, and total wrist arthroplasty. Skeletal Radiol. 2017 Aug. 46 (8):1031-1040. [Medline]. Wolfe SW. Scapholunate instability. J Am Soc Surg Hand. 2001. 1(1):45-60. Whipple TL. The role of arthroscopy in the treatment of scapholunate instability. Hand Clin. 1995 Feb. 11(1):37-40. [Medline]. Kozin SH. The role of arthroscopy in scapholunate instability. Hand Clin. 1999 Aug. 15(3):435-44, viii. [Medline]. Ruch DS, Poehling GG. Arthroscopic management of partial scapholunate and lunotriquetral injuries of the wrist. J Hand Surg Am. 1996 May. 21 (3):412-7. [Medline]. Weiss AP, Sachar K, Glowacki KA. Arthroscopic debridement alone for intercarpal ligament tears. J Hand Surg Am. 1997 Mar. 22 (2):344-9. [Medline]. Ho PC, Wong CW, Tse WL. Arthroscopic-Assisted Combined Dorsal and Volar Scapholunate Ligament Reconstruction with Tendon Graft for Chronic SL Instability. J Wrist Surg. 2015 Nov. 4 (4):252-63. [Medline]. Linscheid RL, Dobyns JH. Treatment of scapholunate dissociation. Rotatory subluxation of the scaphoid. Hand Clin. 1992 Nov. 8(4):645-52. [Medline]. Lavernia CJ, Cohen MS, Taleisnik J. Treatment of scapholunate dissociation by ligamentous repair and capsulodesis. J Hand Surg Am. 1992 Mar. 17 (2):354-9. [Medline]. Blatt G. Capsulodesis in reconstructive hand surgery. Dorsal capsulodesis for the unstable scaphoid and volar capsulodesis following excision of the distal ulna. Hand Clin. 1987 Feb. 3(1):81-102. [Medline]. Dagum AB, Hurst LC, Finzel KC. Scapholunate dissociation: an experimental kinematic study of two types of indirect soft tissue repairs. J Hand Surg Am. 1997 Jul. 22 (4):714-9. [Medline]. Slater RR Jr, Szabo RM, Bay BK, Laubach J. Dorsal intercarpal ligament capsulodesis for scapholunate dissociation: biomechanical analysis in a cadaver model. J Hand Surg Am. 1999 Mar. 24 (2):232-9. [Medline]. Almquist EE, Bach AW, Sack JT, Fuhs SE, Newman DM. Four-bone ligament reconstruction for treatment of chronic complete scapholunate separation. J Hand Surg Am. 1991 Mar. 16 (2):322-7. [Medline]. Brunelli GA, Brunelli GR. A new technique to correct carpal instability with scaphoid rotary subluxation: a preliminary report. J Hand Surg Am. 1995 May. 20 (3 Pt 2):S82-5. [Medline]. Hofstede DJ, Ritt MJ, Bos KE. Tarsal autografts for reconstruction of the scapholunate interosseous ligament: a biomechanical study. J Hand Surg Am. 1999 Sep. 24 (5):968-76. [Medline]. Palmer AK, Dobyns JH, Linscheid RL. Management of post-traumatic instability of the wrist secondary to ligament rupture. J Hand Surg Am. 1978 Nov. 3 (6):507-32. [Medline]. Rotman MB, Manske PR, Pruitt DL, Szerzinski J. Scaphocapitolunate arthrodesis. J Hand Surg Am. 1993 Jan. 18 (1):26-33. [Medline]. Eckenrode JF, Louis DS, Greene TL. Scaphoid-trapezium-trapezoid fusion in the treatment of chronic scapholunate instability. J Hand Surg Am. 1986 Jul. 11 (4):497-502. [Medline]. Kleinman WB, Steichen JB, Strickland JW. Management of chronic rotary subluxation of the scaphoid by scapho-trapezio-trapezoid arthrodesis. J Hand Surg Am. 1982 Mar. 7 (2):125-36. [Medline]. Peterson HA, Lipscomb PR. Intercarpal arthrodesis. Arch Surg. 1967 Jul. 95(1):127-34. [Medline]. Watson HK, Hempton RF. Limited wrist arthrodeses. I. The triscaphoid joint. J Hand Surg Am. 1980 Jul. 5 (4):320-7. [Medline]. Pisano SM, Peimer CA, Wheeler DR, Sherwin F. Scaphocapitate intercarpal arthrodesis. J Hand Surg Am. 1991 Mar. 16 (2):328-33. [Medline]. Hom S, Ruby LK. Attempted scapholunate arthrodesis for chronic scapholunate dissociation. J Hand Surg Am. 1991 Mar. 16 (2):334-9. [Medline]. Viegas SF, Patterson RM, Peterson PD, Pogue DJ, Jenkins DK, Sweo TD, et al. Evaluation of the biomechanical efficacy of limited intercarpal fusions for the treatment of scapho-lunate dissociation. J Hand Surg Am. 1990 Jan. 15 (1):120-8. [Medline]. Garcia-Elias M. Treatment of scapho-lunate instability. Ortop Traumatol Rehabil. 2006 Apr 28. 8(2):160-8. [Medline]. Ogunro O. Dynamic stabilization of chronic scapholunate dissociation with palmaris longus transfer: a new technique. Tech Hand Up Extrem Surg. 2007 Dec. 11(4):241-5. [Medline]. Short WH, Werner FW, Sutton LG. Treatment of scapholunate dissociation with a bioresorbable polymer plate: a biomechanical study. J Hand Surg Am. 2008 May-Jun. 33 (5):643-9. [Medline]. Danoff JR, Karl JW, Birman MV, Rosenwasser MP. The use of thermal shrinkage for scapholunate instability. Hand Clin. 2011 Aug. 27(3):309-17. [Medline]. Shin AY, Weinstein LP, Berger RA, Bishop AT. Treatment of isolated injuries of the lunotriquetral ligament. A comparison of arthrodesis, ligament reconstruction and ligament repair. J Bone Joint Surg Br. 2001 Sep. 83(7):1023-8. [Medline]. Pillukat T, Fuhrmann RA, Windolf J, van Schoonhoven J. [Ligament reconstruction for lunotriquetral instability using a distally based strip of the extensor carpi ulnaris tendon]. Oper Orthop Traumatol. 2015 Oct. 27 (5):404-13. [Medline]. Pin PG, Young VL, Gilula LA, Weeks PM. Management of chronic lunotriquetral ligament tears. J Hand Surg Am. 1989 Jan. 14 (1):77-83. [Medline]. Kirschenbaum D, Coyle MP, Leddy JP. Chronic lunotriquetral instability: diagnosis and treatment. J Hand Surg Am. 1993 Nov. 18 (6):1107-12. [Medline]. Shin AY, Battaglia MJ, Bishop AT. Lunotriquetral instability: diagnosis and treatment. J Am Acad Orthop Surg. 2000 May-Jun. 8(3):170-9. [Medline]. Chaudhry T, Shahid M, Wu F, Mishra A, Deshmukh S. Soft tissue stabilization for palmar midcarpal instability using a palmaris longus tendon graft. J Hand Surg Am. 2015 Jan. 40 (1):103-8. [Medline]. von Schroeder HP. Dorsal Wrist Plication for Midcarpal Instability. J Hand Surg Am. 2018 Apr. 43 (4):354-359. [Medline]. Chamay A, Della Santa D, Vilaseca A. Radiolunate arthrodesis. Factor of stability for the rheumatoid wrist. Ann Chir Main. 1983. 2(1):5-17. [Medline]. (Click Image to enlarge.) Watson scaphoid shift test. (Click Image to enlarge.) Kleinman shear test. Mayo dorsal intercarpal (DIC) capsulodesis. Copyright Mayo Clinic, used with permission of Mayo Foundation. Disclosure: Received royalty from Tornier for independent contractor; Received ownership interest from Tornier for none; Received royalty from Lippincott for independent contractor. Case Challenge: How Would You Treat This Hand Deformity?